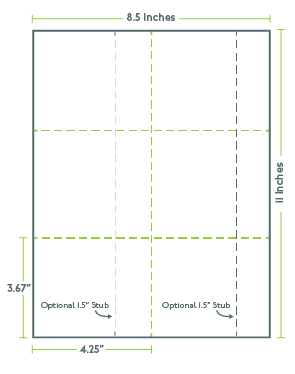 2 cols x 3 rows 8.5"x11"
Need pre-perforated sheets that produce 6 pieces measuring 4.25" x 3.67"? Look no further! Not only does this affordable perforation layout fit the bill, but it’s available in a variety of paper colors and high-quality card stocks, and can be used in just about any copy machine, inkjet printer, or laser printer. Print your own certificates, brochures, large tickets, and big raffle tickets. Letter-sized, 8.5-inch by 11-inch sheets. Micro-perforated in 2 columns by 3 rows and available with 1.5-inch stubs. Extra fast order processing and delivery. PerforatedPaper.com…your source for quality, custom perforated paper!